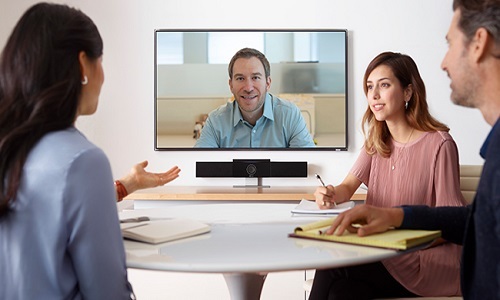 Plantronics, a manufacturer of enterprise communication equipment, today announced its Polycom Studio video conferencing solution. With its release, the Polycom Studio becomes the company’s first entry into the video conferencing market. The Polycom Studio is a 4K webcam, beamforming microphone, and stereo speakers all rolled into one. The device requires only one USB connection as opposed to the multiple if the devices were standalone. Whereas most webcams shoot in 1080p, the Polycom Studio shoots in 4K, one of the highest resolutions available to webcams. Currently, the only other 4K webcam is the Logitech Brio. Seeing higher specifications is always great, but many meeting platforms like Skype has a resolution cap. The webcam supports 120-degree field-of-view and smart camera tracking. Audio is arguably as important as audio quality. The Polycom Studio comes with a beamforming microphone array. The array consists of six microphones, and supports echo and noise cancellation. Designed for smaller huddle rooms, the microphones have a 12 feet pickup range. Volume controls for the microphone and speakers can be controlled using the included remote. The Polycom Studio is plug-and-play, which means it uses standard media drivers to run. It’s fully compatible with web conferencing programs including Microsoft Skype, Team, Google Hangouts, Zoom, Amazon Chime and Cisco Webex. The Polycom Studio can be centrally managed through the network. The Polycom Studio will be available in Q1 2019. Pricing has yet to be determined.